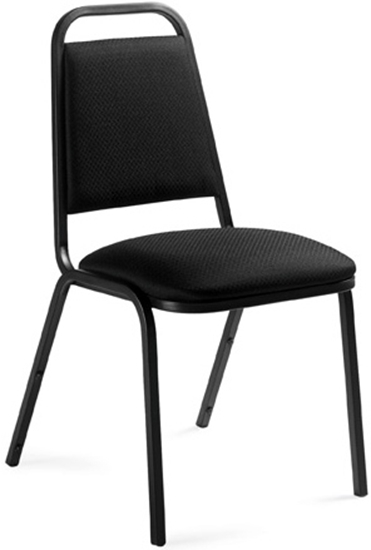 One of our most inexpensive stacking office chairs this model from Offices to Go can be stacked 10 high. 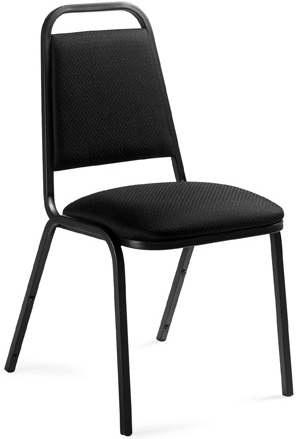 This stacking chair is an ideal solution for a multipurpose area, waiting room or conference room. Must be purchased in quantities of two (2). Available in stylish, durable Black fabric. Get free shipping and warranty on all discount office furniture. Durable, textured black or charcoal grey fabric. Black epoxy powder coated frame. Floor and stacking bumpers included. Can be stacked 10 high. 2 chairs per carton (price each). Offices to Go warrants its products to be free from defects in material and workmanship subject to the limitations below. This warranty is made by Offices to Go to original end user customers acquiring the product directly from authorized Offices to Go dealers. The customer's sole remedy under this warranty is limited to repair or replacement at Offices to Go's option. Consent from Offices to Go must be obtained before any warranty work is performed. This warranty shall not apply to any products which must be replaced due to normal wear and tear, negligence, abuse or "accident", shipping damage or product use other than in accordance with written instructions or warnings. It will also not apply when product has been modified or altered, repaired or refurbished by someone other than Offices to Go. This warranty does not cover the cost of transportation or labor. Offices to Go can make no warranty that any of its products are suitable for any particular purpose and can make no other warranties, expressed or implied. In no event shall Offices to Go be liable in either tort or contract for any loss or direct, special, incidental, consequential or exemplary damages. This warranty is not valid if the products are used for rental purposes. Under this warranty, claims must be made within the following periods from the original date of purchase: (a) non-moving parts are warranted for five years; (b) gas cylinders, mechanisms and other moving parts are warranted for two years; and (c) upholstered materials and foam are warranted for two years. Warranty is based on an eight hour, single-shift work day and for users weighing up to 250 pounds.